Despite the immense success of business schools, why is their teaching so widely contested? 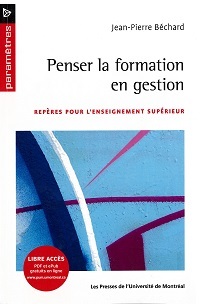 That’s the starting point of the new book by Jean-Pierre Béchard, Professor of Management, entitled Penser la formation en gestion – Repères pour l’enseignement supérieur. The author offers a critical summary of advances in knowledge over the past 25 years, from the angles of course content, teaching tools, programs of study and educational values. He looks at the emergence and expansion, in both breadth and depth, of the thinking central to discussions about the management curriculum, and outlines a set of guidelines for schools wishing to revamp the programs they offer. Note that Professor Béchard’s publication is also available free of charge in digital form, as part of a pilot project for free access to e-books in co-operation with the libraries department of the Université de Montréal. Jean-Pierre Béchard is a Full Professor and has been the Director of the Department of Management at HEC Montréal since 2014. He was previously the Academic Director of the School’s certificate programs, from 2008 to 2013. His research, teaching and consulting interests revolve around the teaching of management, the epistemology of university teaching, and innovation in higher education. Penser la formation en gestion – Repères pour l’enseignement supérieur, de Jean-Pierre Béchard, collection Libre accès, Presses de l’Université de Montréal, February 2016, 198 pages. Available at Coop HEC Montréal.